I have to admit that I’m always shopping. Whether I’m physically shopping in store, or even just looking online, I always have a wishlist ready no matter what. These are the items I’ve had my eye on for a while. Make sure you stay with me on social media so that I can let you know what I actually decided to purchase! These jeans are all that I have been looking for. I’ve seen a bunch of blue denim with either a white or red thick stripe, and black denim with white or red stripes, but this has both red and white which is a plus for me. The red isn’t too overpowering so you can still make it stand out by wearing a red shoe, or just have it there as an accent color. I would probably style this white a white t-shirt, and either red booties or white sneakers depending on the look I was going for. I might even go with a graphic tee, and my black old school vans. As you scroll down, you’ll see that I’ve clearly been dreaming of owning every Cami in the world. I have seen these ALL over Pinterest worn with all different kinds of outfits. This black one is just an essential that will never go out of style and there are endless ways to style it. From blazers to knit cardigans, the limit does not exist! P.S. if you got that Mean Girls reference, we’re going to be best friends. This is such a unique color that I don’t have enough of in my closet. I love the button detailing, and the fact it is more casual because of the material. They have it in white as well but Spring is all about bringing on the color! Especially the pastels. This would pair beautifully with any color denim, making it so versatile. You know those shirts that you buy, end up wearing every day then being to ask yourself what you ever wore before you bought this? This might be it for me. I would throw on some brown sandals, jeans, shorts, maybe even a pair of trousers and be good to go. Okay I clearly saved my favorite for last. Blush Pink is one of my all time favorite colors, and I honestly wear it all year round. 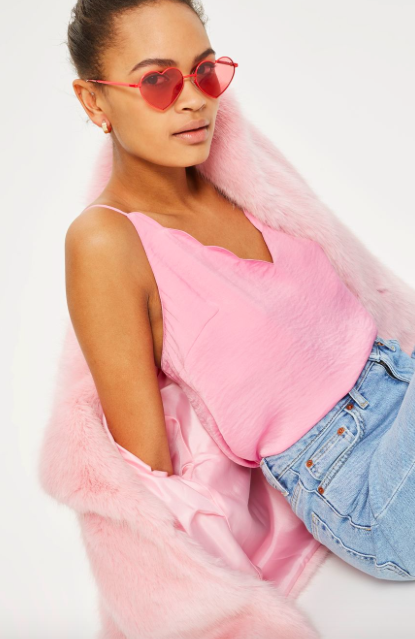 However, Spring is the perfect excuse to whip out your favorite pink items. I love the satin material and this could easily add a refreshing pop of color to your outfit. I would probably pair this with white or brown sandals, and some light denim. It would look great with all denim colors, even white, but there’s just something about blush pink and light denim that really works for me. If pink isn’t your color, this top also comes in a beautiful grey and mustard color! I know I said that I have been eyeing everything on this list for a while, but I have really been debating this one for a couple months. I love the pattern on it, and I love that it has a little bit of red in it as well. It looks beautiful on the model paired with her beret, I’m loving the Parisian vibe that this is giving. 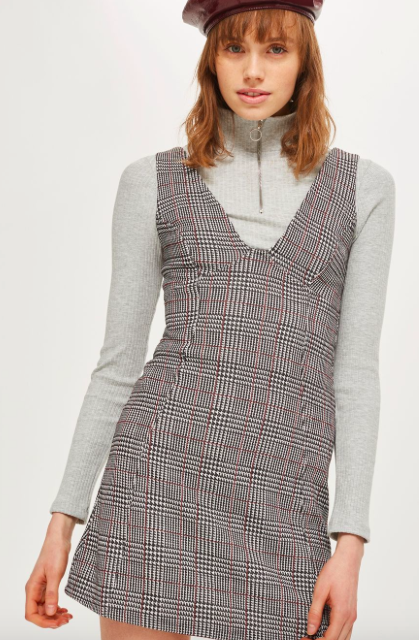 I would probably pair this with a black turtle neck underneath, or maybe even a burgundy turtle neck to really pull the color out of the dress and make it more noticeable. I would definitely throw on a pair of black booties just to make the outfit looks that much more chic. If I’m feeling extra bold and trendy, then I would throw on a black baker boy hat also! 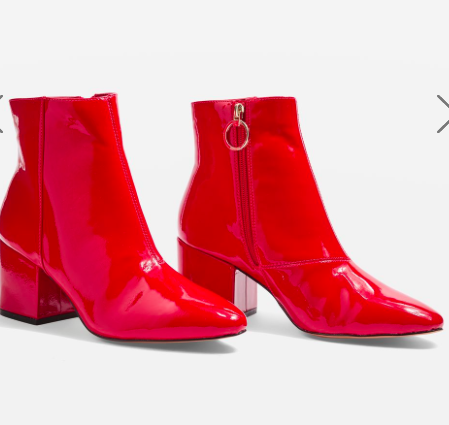 Red boots aren’t something I knew I wanted until I actually made the Spring Trends blog post. I like the fact that these are patent, and they look like a great shade of true red. 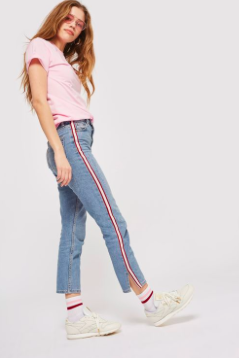 I was inspired to get some type of red shoe because I saw so many inspo pics of red side stripes on pants and red shoes to complete the look. These are definitely something different and out of my comfort zone so if I do decide to take the plunge, it would definitely be fun to experiment with these. A white purse has been something that I have been interested in ever since I bought my white booties. Sometimes I feel like the white boots can be a bit harsh…especially with an all black outfit. Adding in a white purse would be a good way to incorporate more of the color into your outfit so that it works better together. You definitely can’t fit much in here, but sometimes having a little purse is so much more convenient than carrying a huge tote bag with you. 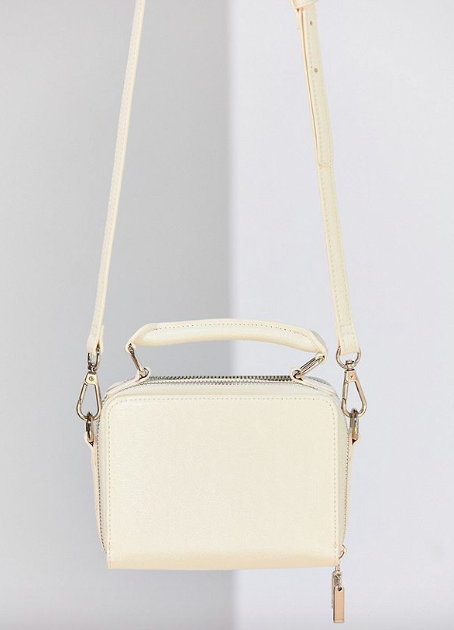 I actually love small bags and this white one would be perfect for the upcoming warmer seasons. 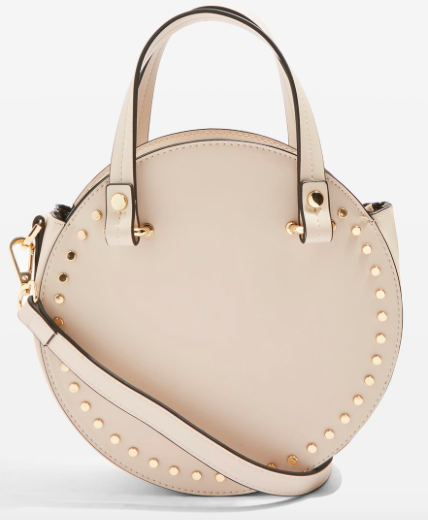 Like I said, I have been loving the new circle bag trend, and this is no exception. I love the fact that this one has gold hardware, that is always a plus in my book. It doesn’t look like this one is a stark white color, it looks more of a cream to me, which I actually think would transition better into the colder months as well. Can you guess what drew me in on this hat? The color, DUH! How perfect is this shade of baby pink?! This would be so cute to add a pop of color into your outfit, and matching it with your shoes or purse would be so fun. 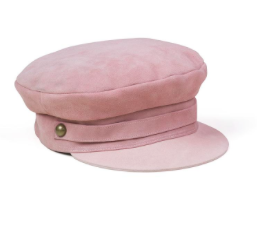 This hat is the perfect way of continuing the baker boy hat trend into spring and if the price tag on this wasn’t so hefty, I 100% would have already purchased and worn this more times than my fingers could count.